As the sun begins to set on the summer season, families are looking for ways to enjoy time together before seasonal attractions close. Many are taking advantage of some noteworthy savings for Silver Dollar City, Branson, Missouri’s premier attraction. For the price of a $58 one-day ticket, visitors can now receive a whole second day admission for free. 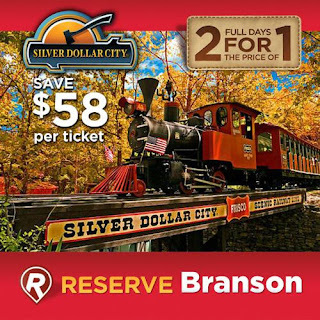 This free day offer is not available at Silver Dollar City’s main gate— tickets must be purchased in advance on Reserve Branson’s website http://www.reservebranson.com. Reserve Branson is a St. Louis-based travel reservation company committed to providing travelers with special deals and offers that competitors can’t match. The 2 days for the price of 1 tickets are an exclusive offer not available at Silver Dollar City’s gates. Although the second day’s ticket must be used within two operating days of the first ticket’s use, vacationers can save $58 per ticket. In addition to regular admission tickets, Reserve Branson offers package bundles for those looking to save on attraction tickets along with hotels. The website allows travelers to plan and purchase an entire custom vacation package, and can often save $100 or more. Silver Dollar City is only one of a host of family-friendly attractions found in the Missouri Ozarks; other local points of interest include Dixie Stampede—a dinner and show that always earns rave reviews—and White Water—the only outdoor water park in Branson. 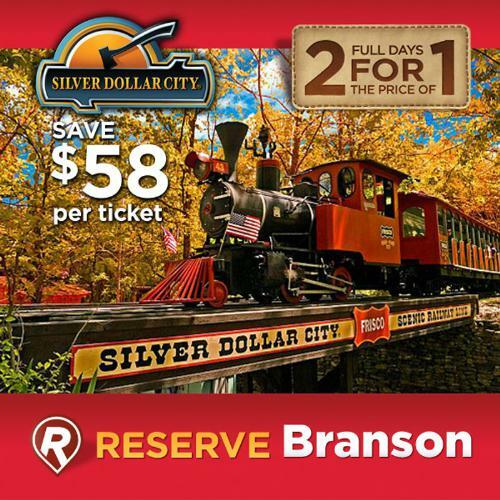 The complete list of vacation packages can be explored here: http://www.reservebranson.com/sp/silver-dollar-city-packages-in-branson-mo. For more than 50 years, Silver Dollar City has been the leading attraction in Branson, entertaining people from around the world. This 1880s-style theme park has won accolades for its uniquely memorable guest experience. With 40 live shows every day, 30 thrill rides and attractions, and 60 unique shops stocked with locally crafted goods, a single day is hardly enough time to see everything the park has to offer. Silver Dollar City continually looks for ways to keep visitors entertained. The Outlaw Run Coaster is among the newest attractions at the park. A ride for the record books, Outlaw Run is the only wooden coaster to twist upside down. It also has the steepest drop for a wooden coaster and the second-fastest top speed at 68 mph. Younger guests can have fun, too: Geyser Gulch and The Grand Exposition are play areas designed especially for children. Reserve Branson has worked closely with Silver Dollar City since 2001. The company’s value-based ticket options and vacation bundles represent some of the best deals in the industry. Reserve Branson’s mission is to help more people enjoy a complete Branson experience, even on a budget. As a one-stop vacation-booking site, Reserve Branson allows travelers to shop for, compare and book lodging, activities and attractions at competitive discount prices. Tickets purchased on the Reserve Branson website can be printed out immediately or sent via regular mail. Buyers can receive a full refund as long as the order is cancelled one day prior to the scheduled use date.